Irving “Lord Burgess” Burgie, the man who gave the world the banana boat song that became a global anthem and was named Song of The Century, turns 93 today , July 28, 2017. News Americas, NEW YORK, NY, Fri. July 28, 2017: Say ‘Day-O’ and immediately thoughts of Harry Belafonte may pop into your head. But did you know it was a Barbadian-roots musician who actually wrote the song and many others on album that shot Belafonte’s music career to fame? Irving “Lord Burgess” Burgie, the man who gave the world the banana boat song that became a global anthem and was named Song of The Century, turns 93 today and is still hard at work. The celebrated composer of Caribbean music, whose songs put Belafonte on the world map and helped create the first ever million selling album, is going strong and is marking his July 28th birthday by announcing two new projects. Burgie, who was inducted into the Songwriters Hall of Fame in 2007, is working on a Christmas release of a new album of revised tunes from the pioneering million-plus selling “Calypso” album, along with other popular songs he wrote for Belafonte. Fans of the Calypso genre are in for a treat this holiday season since songs such as “Day-O,” “Jamaica Farewell,” “Island in the Sun,” “Angelina,” “Mary’s Boy Child,” ‘Yellow Bird” and “Land of Sea and Sun,” will all be on one album, Burgie said, serving as the perfect stocking stuffer. “I’m hoping to re-introduce these songs to a third generation – from the 1950’s, to the 1989 ‘Beetle Juice’ generation to this new generation in 2017,” said the Brooklyn-born, Jamaica, Queens’ resident, a veteran of World War II and an alumnus of the Juilliard School of Music, who has been lucky to live out his dreams with a meteoric rise to the top echelons of the music business. Burgie’s songs have sold over 150 million copies to date and have been featured on Broadway, in many TV shows, in movies and in numerous places, including ball parks globally. The former folk singer and performer who wrote almost three dozen of the songs appearing on Belfonte’s 1956, 1957, 1961 and 1966 albums, also plans to re-craft his 1963 Off-Broadway musical, ‘The Ballad For Bimshire,’ set in his mother’s Barbados homeland, into a screenplay. And ‘The Father of Modern Calypso’ has his sights set high, hoping that that Bajan-born star Rihanna will consider a role in the new movie. Burgie, who wrote the Barbados national anthem in 1960, has been recognized by many notables, including Maya Angelo and Whoopi Goldberg as well as St. John’s University, the University of the West Indies and City College of New York, which have all presented him with honorary doctorate degrees. 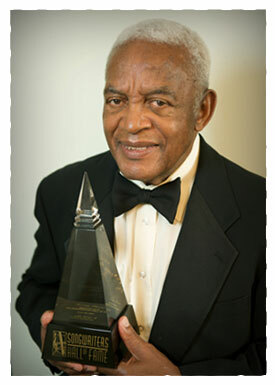 In his honor, the ASCAP Foundation has established the Irving Burgie Scholarship, which is presented annually to an African-American songwriter from New York City. Lagerfeld says Ghesquiere with Arnault "not bad idea"